CIOReview’s editorial research team analyzed over 400 companies focused on providing Salesforce solutions and awarded Adventace® as one of the Top 20 Most Promising Salesforce Solution Providers in 2015. If any of these challenges sound familiar, we think we have the answer! 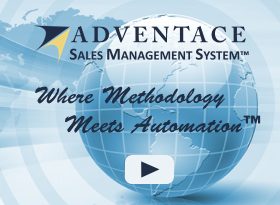 Adventace SMS™ is a methodology-independent application that automates all key functions needed by Sales Executives, Sales Managers, and Sales People to run a better sales operation, backed by metric-based performance improvement. 25+ years of globally-based sales and sales management expertise have driven the functions in SMS processes and tools. It was designed as a complete, top-driven sales management system: It helps Sales Executives better drive their entire sales operation top-down through use of key leading performance metrics. It helps Sales Managers better manage sales people and improve their skills, while running a better operation. Its expert functions make it an indispensable differentiator and time saver for Sales People, helping them to generate key buyer deliverables in minutes while better managing their opportunities and internal resources. Watch the video at Adventace SMS™ Video. Using operationally critical leading performance metrics, executives are better able to drive their entire sales operation top-down. These metrics determine the organization’s Goal Vs. Actual performance in real time. And how’s this for proactive management: With a simple click, executives can easily drill down into their organization to find out where group or individual performance difficulties exist, then work with management to optimize performance. Pipeline Management: Based on well defined, “no wiggle room” opportunity stages, SMS performs a complete pipeline analysis. It determines a seller’s optimal pipeline goals for each stage and whether gaps exist. It then provides a color-coded pipeline so managers can make surgical pipeline recommendations. Forecast Management: A 30/60/90 day forecast is provided, weighted by stage. Skill Development: Complete skill development systems are provided to help sellers, sales managers, channel managers, and senior sales managers. Here, managers grade an individual in each key skill related to their job function. Based on the individual’s scores for those skills, SMS then provides Personal Development Plans to help managers measurably improve an individual’s performance, helping to unlock their potential. Opportunity Assessment: Managers are able to quickly identify early where problems exist on opportunities and identify the appropriate fix. An Impact Tree™, showing the interdependence of the issues between key buyers. You can then select the appropriate email template, generate your email, and send it to your buyer, who responds with a call saying, “You understand our business better than we do!”. And you know you have made yourself their first choice! These are the indispensable functions Adventace SMS™ provides sales people…functions sellers have called “indispensable”. If you’d like to see a list of SMS’s functions you can take a look at Functional Specifications.